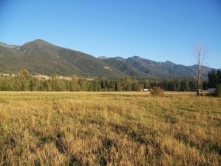 Mission Mountain Magic Acreage has a delightful mix of a mature variety of trees and lush meadows. In addition, with water on 2 sides and no private land on 3 sides; this offers a rare privacy for a building site. One will never see a neighbor’s house, while also enjoying incredible mountain views. Good sub-irrigated meadows, nice variety of trees, nice creek and easy access to trail heads, lake, and all services. Often considered the most spectacular mountain range in the lower 48 states, this is a treat, not only for the eyes but also for hikers, horseback riders, fishermen, huckleberry pickers, and wilderness lovers. Countless improved trails in almost every drainage; follow creeks to pristine mountain lakes stocked with cutthroat trout, and incredible tumbling waterfalls that cascade down these majestic mountains. Within the confines of the Flathead Salish-Kootenai Reservation, big game hunting is not allowed, however, for a real adventure one can traverse across one of the several passes to enter the Federal Mission Mountain Wilderness, which begins at the crest of the range and offers excellent big game hunting. Recreation is plentiful with good fishing in the Flathead River, Flathead Lake and several reservoirs and streams. In a flyway, this area is also well known for excellent duck and goose hunting, as well as, ring-neck pheasants and Hungarian partridges. Flathead Lake, the largest fresh water lake West, of the Mississippi, is famous for its sailing, boating, water sports, swimming, and fishing. Several excellent golf courses can be found in nearby Ronan, Polson or Pablo. Enjoying one of Montana’s most temperate climates, this is also a very productive agricultural valley. The snowcapped mountains and vast water-shed assure one of the best irrigation projects anywhere, keeping the area lush and green all summer long. Winter recreation also abounds with 3 of Montana’s best ski areas nearby; Snowbowl, (68+/- mi. ), Blacktail, (56+/- mi. ), and Big Mountain, (89+/- mi.). Ice fishing, cross country skiing, snowmobiling and just about every type of outdoor recreation is readily available. One of the prettiest and most appealing areas imaginable, this part of the world has lots to offer.